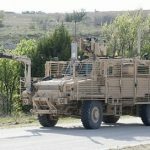 U.S. Army soldiers have tested a new Multi-Functional Video Display system for the Medium Mine Protected Vehicle Type II platform designed to provide commanders and crew members with complete visibility around the vehicle and detect potential explosives. The service branch said Friday soldiers from the 509th Engineer Company, 5th Engineer Battalion, 36th Engineer Brigade evaluated the MVD monitors and gathered data that can help the Army Operational Test Command integrate the displays on MMPV Type II vehicles. Route clearance soldiers and operational testers performed assessments on the MVD systems at Fort Leonard Wood in Missouri. “We are also collecting data on the reliability, availability, and maintainability of the MVD, so that we can identify any issues causing malfunctions of hardware failure now, rather than after fielding of the equipment,” said Heidi Watts, chief of the USAOTC maneuver support test division. “The importance of collecting data on the MVD is to verify the usability of the MVD by Soldiers in an operational context … We want to ensure that any issues the Soldiers have with the system are discovered now,” added Maj. Michael Fleischmann, operational research and systems analyst and data project manager for the test.